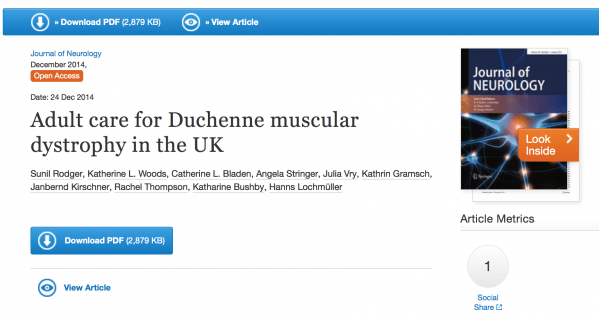 My latest publication, Adult care for Duchenne muscular dystrophy in the UK, is now available via SpringerLink under an Open Access license and will be published in a forthcoming issue of the Journal of Neurology. Press releases are available from the Muscular Dystrophy Campaign and Newcastle University, so I will provide a summary of the background to the study and our findings. The paper compares the care experienced by UK adults living with Duchenne muscular dystrophy (DMD), a life-limiting progressive neuromuscular condition, with that received by children in the UK and by adults in Germany, Denmark, and Eastern Europe. The paper stems from the CARE-NMD project, which investigated care across seven European countries, with which I was involved while working for TREAT-NMD. Life expectancy for DMD has significantly improved over the past four decades thanks to improvements in care, and many adults now live with the condition into their thirties or even forties. However, it remains a very serious disease that needs high quality multidisciplinary care in line with international guidelines. Progressive complications develop during the teenage years and adulthood particularly affecting the heart and lungs. For the growing community of adults who live with DMD, frequent monitoring and interventions as required are crucially important pillars of good care. All of those with DMD aged 10 years or older should receive at-least-annual heart checks (echocardiograms), and those who are no longer able walk should have certain lung function checks at least every six months. However, 19% of respondents received neither of these at-least-annually, and more than four in ten received only one or the other at-least annually. Adults with DMD are less likely than children to receive the recommended heart and lung checks for their age. In DMD, as with other chronic conditions, transition of care as someone moves from childhood to adulthood is often challenging. Comparing care for three age groups – the under–10s, those aged 10–17 years, and adults – we observed that those aged 18+ are less likely than those aged 10–17 to receive at-least-annual heart and lung function checks. As the teenage years are typically the time when lung and heart problems manifest, the drop-off in care at this time is particularly concerning. Adults are less likely to attend a specialist neuromuscular clinic than children. In fact, although the proportion with 6-monthly attendance at a specialist is somewhat higher than other countries, more than one in five UK adults (22%) never attend a specialist at all – the highest rate of rate of total non-attendance amongst the three Western European countries we surveyed. Across countries, we also found attendance at a specialist neuromuscular clinic is associated with recieving at-least-annual lung and heart function checks, better provision of information to patients, and higher satisfaction with care. Access to professional physiotherapy is poor for both children and adults in the UK, and in both cases is lower than any other country we surveyed. In the UK less than one quarter of adults reported any kind of professional physiotherapy compared to approximately 9 in 10 in Germany and Denmark, and half of patients in Eastern Europe. Almost two-thirds of UK adults report that they formerly received physiotherapy but no longer do, again suggesting difficulties at transition. The inclusion of UK adults with DMD in wider society lags behind other Western European countries. The UK has the highest proportion of adults living at home (92.9%) and the lowest independently or with a partner; it also has lowest proportion in either employment or education (25.6%). The number of nights in hospital experienced by adults with DMD in the UK was lower than elsewhere. For children, the UK also has both high satisfaction with care and good adherence to the care guidelines. It is also worth remembering that many adults do get good care – but as these data show, there are a sizeable minority who do not. Clinicians treating neuromsucular diseases such as DMD – and the teams they lead – work very hard to deliver the best possible care, often with exceedingly limited resources. The study highlights shortcomings in care compared to published guidelines for some adults in the UK. As far as we know, this is the first time that care for adults has been examined in this way, and compared to care for children and care for adults in other countries. The good news is that simple measures can have a big impact. Regular checkups 1–2 times per year as part of compliance with existing care guidelines for all adults would be an excellent start. According to the respondents to the survey, most adults already receive reasonably good care – the challenge is to keep improving care in light of improved knowledge, and to ensure all adults with DMD have access. This is more important than ever before, as more adults live longer with DMD and don’t let the condition hold them back. I’d like to thank all of my co-authors on this paper, which resulted from work done over the past 5 years by many groups around Europe. My thanks therefore also go to the rest of the CARE-NMD project team, the project partners and collaborators, especially Action Duchenne (who run the UK DMD registry), the Muscular Dystrophy Campaign, and DMD Pathfinders. Finally, and most importantly, I’d like to thank all of the people living with DMD and their families for completing the CARE-NMD survey and providing us with information about the care they receive. Without their input, this work could not have happened.